This is more for social enterprises and charities that are raising funds in order to continue to operate and/or grow rather than for startups. The trick is to do these in parallel. 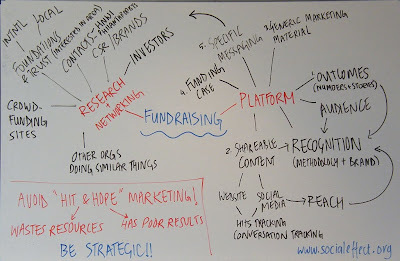 Start your research and network to build relationships with potential funders, while simultaneously putting the platforms in place. This means that by the time you've built your relationships with the people interested in your work, you've also got all your messaging sorted out and ready to go. Shareability = having the technical ability to share your content in social media, as well as creating and chunking it so that it is valuable and motivates people to pass it on.